Kenya teachers have told President Uhuru Kenyatta they cannot teach and will not teach without government honoring its part of the court ordered pay rise. According to the Kenya Daily Nation, the statement represents the teachers' feedback to Kenyatta's disclosure that the government has no money to pay the teachers and cannot honor the pay rise, meaning that the court orders mean nothing to him. The teachers' leader on Sunday said the presidents' words are capable of throwing the country into chaos, according to the news report. "The president's statement is arrogant," said the Knut secretary-general Wilson Sossion and national chairman Mudzo Nzili. Both men said that the teachers who have been on strike for the past two weeks will respond with the same arrogance by refusing to instruct the teachers order the teachers back to class. President Kenyatta who had been quiet about the strike - now in its third week - describes the teachers’ salary pay rise as ordered by a court of law as untenable. Kenyatta added that the demand for pay rise is not only unsustainable, but that it will lead to imbalances in the civil service wages and spark fresh demands by other workers. “Over 50 per cent of what government collects now goes to paying salaries and, with the new demands, we will be at over 60 per cent. What is going to be left for development? 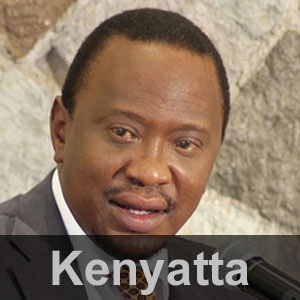 Kenyatta reportedly added, "We have to start looking at some of these demands against the economic reality. To pay more, we must be able to make more first,” Mr Kenyatta told journalists at the State House. Is Kenyatta opposition against the teachers, observers have asked. The answer is that observers say Kenyatta is fighting the law courts and the rule of law. They say a law has ordered the pay rise and the order has been upheld by a higher court of appeal. They say that Kenyatta has no choice, but pay the teachers and let Kenya children return to the classroom. They say a ten percent rise in wages as Kenyatta has claimed isn't too much, that the government only has to be proactive and see how it can source money through taxation and other sources than allow Kenya children to suffer. Mr Atwoli accused the President of failing to call a meeting of workers’ unions when he landed in the country on Friday morning, and accused him of being insensitive to workers’ demands. People say Kenyatta is being insensitive to teachers's plight and children's suffering. He has been asked to resign for blatantly disobeying court orders, and they it is the same courts that declared his election valid in 2013. Kenyatta has been advised variously to put on hold his ambitious laptops project and spend Sh17 billion lying idle for three years to pay teachers. The opposition, leader, Raila Odinga, has asked President Kenyatta to divert funds meant for what he said were fictitious National Youth Service projects to pay teachers.